From the acclaimed and award-winning author of Anywhere But Here and My Hollywood, a powerful new novel about a young boy’s quest to uncover the mysteries of his unraveling family. What he discovers turns out to be what he least wants to know: the inner workings of his parents’ lives. And even then he can’t stop searching. Mona Simpson studied poetry at Berkeley and attended graduate school in Columbia's MFA program. She has also written The Lost Father, A Regular Guy and Off Keck Road. 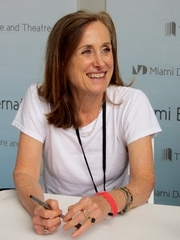 Her work has been awarded several prizes: a Whiting Prize, a Guggenheim, a grant from the NEA, a Hodder Fellowship from Princeton University, a Lila Wallace Readers Digest Prize, a Chicago Tribune Heartland Prize, a Pen Faulkner finalist, and most recently a Literature Award from the American Academy of Arts and Letters. Mona Simpson is currently considered a "single author." If one or more works are by a distinct, homonymous authors, go ahead and split the author. Mona Simpson is composed of 2 names. You can examine and separate out names.